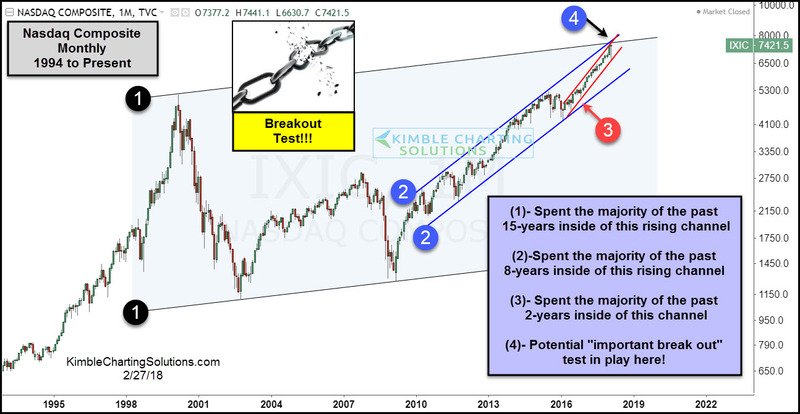 Tech - Most Important Breakout Attempt Since 2000? This 20-year snapshot of the Nasdaq above highlights that a solid upward trend remains in place. What caught our attention is this, the Nasdaq Composite index is attempting to break out of the top of three different rising channels at the same time at (4). If it breaks one, it breaks the other two! Bulls would love nothing more than see that happen! Tech bulls would love to see a breakout at (1) and above the 15-year rising channel in the top chart at (4). To get a quality breakout, bulls would prefer to see the ratio act stronger and turn up, as it has been diverging from the NDX for the past few years!